How do I make an appointment with one of the Consultants? If you wish to make an appointment a referral letter is required from your GP/Chartered physiotherapist. This can be sent to Mayo Medical Centre either by fax, email or post. Once the referral letter has been received an appointment letter will be sent out directly to the patient. Uninsured and International patients are welcome at our clinic. We will schedule a consultation with Mr. Bennett. Usually the cost of consultations can be reimbursed by the Cross Border Healthcare Directive. At your consultation you will be evaluated for suitability for hip replacement surgery and we can usually schedule a date for surgery within a few weeks. All relevant recent (preferably within the last 6 months) X-ray/MRI scans on a disc. Insurance details including the plan and policy number. Why Should I see a specialist hip and knee replacement surgeon rather than a general Orthopaedic surgeon? Most primary first time hip and knee replacements can be done by a general Orthopaedic surgeon. 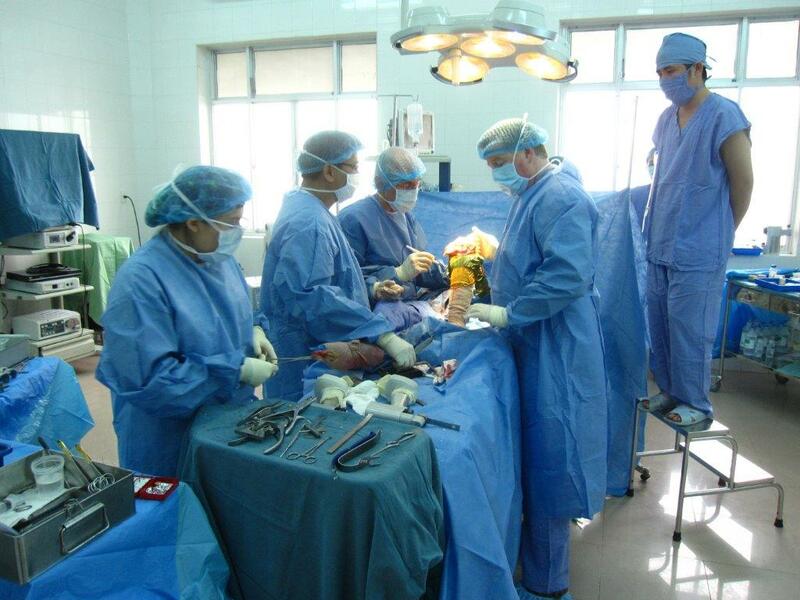 However, a specialist arthroplasty (joint replacement) surgeon will have specific training in preventing and treating complications of hip and knee replacement surgery. At Mayo Medical Centre we believe that all of our surgeons should specialise in a specific area as this has been scientifically proven to reduce complications, enhance the quality of the surgical work and facilitate a more rapid recovery by the patient. It depends on the type of work you do. If you do mainly office based work you should be able to return to work in a few weeks. However if you do mainly manual physical work we recommend that you don’t return to work for at least 12 weeks after your operation. If you are unsure please check with your Consultant. How long will I need crutches after the surgery? You will be taught how to use the crutches before your surgery. We ask you to keep the crutches for approximately six weeks after surgery to allow your muscles to heal around the joint although the joint itself will take your full body weight from the first day of surgery. How long you will remain in hospital depends on the procedure you are having and whether there are any complications. Generally hospital stay is five days for a hip or knee replacement. When will I see my Consultant again after surgery? Follow up appointments with our Consultants are usually at six weeks post op, six months post op, 2 years post op, five years post op and then every five years after that. Why do I need to see my Consultant at six months post op? Mr. Bennett recommends a six month review as do the British Orthopaedic Society. One’s hip can develop a problem without symptoms so it is important to get an x ray at six months to confirm all is well. How many physio sessions will I need after my surgery? We normally recommend a patient to have 6 physio sessions. The first session preferably before surgery, the second session 2 weeks post op and then at weekly intervals afterwards (i.e. week 2,3,4,5 and the final session on week 8). However this can vary from person to person. What type of anaesthetic will I receive? You will almost always receive an epidural type anaesthetic into the back. This will leave you feeling numb from the waist down. The benefits of this mean you will have less pain after surgery, you are less likely to get a clot and less likely to get an infection after surgery. What is the procedure code for my surgery?